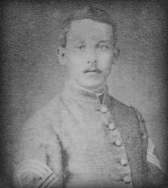 Captain B G Humphreys, 1st Mississippi Battalion Infantry, Company I, was appointed colonel, 21st Mississippi Infantry, on 26 September, 1861, dated 11 September, 1861. Captain W L Brandon, 1st Mississippi Battalion Infantry, Company D, was appointed major, 1st Mississippi Battalion Infantry, on 11 June, 1861, and lieutenant colonel, on 17 July, 1861. Lieutenant Colonel W L Brandon, 1st Mississippi Battalion Infantry, was appointed lieutenant colonel, 21st Mississippi Infantry, on 26 September, 1861. J G Taylor was appointed major, 1st Mississippi Battalion Infantry, on 17 July, 1861, and lieutenant colonel, 2nd Mississippi Battalion Infantry, on 1 November, 1861. The company was accepted in state service at Vicksburg, Warren County, Mississippi, on 15 May, 1861, and was ordered to Richmond, Henrico County, Virginia, by Special Orders No.57, Paragraph I, Adjutant & Inspectors General's Office, Montgomery, Montgomery County, Alabama, on 29 May, 1861, dated 23 May, 1861, and arrived on 4 June, 1861. The company was mustered in Confederate service for the war at Richmond, Henrico County, Virginia, by Captain J Scott, cavalry, Confederate States Army, on 5 June, 1861, and Captain D N Moody, 21st Mississippi Infantry, Company A, was appointed major, 21st Mississippi Infantry, on 1 November, 1861. The company was accepted in Confederate service at Vicksburg, Warren County, Mississippi, on 20 May, 1861, was ordered to Richmond, Henrico County, Virginia, in the morning on 26 May, 1861. The company was mustered in Confederate service for the war at Richmond, Henrico County, Virginia, by Captain J Scott, cavalry, Confederate States Army, on 4 June, 1861, and was assigned to the 2nd Mississippi Battaion Infantry, Company G, at Yorktown, York County, Virginia, under the command of Lieutenant Colonel J G Taylor, 2nd Mississippi Battaion Infantry, by Special Orders No.71, Adjutant & Inspector General's Office, Richmond, Henrico County, Virginia, on 28 March, 1862. The company was accepted in Confederate service at Brookhaven, Lincoln County, Mississippi, on 25 May, 1861, and was ordered to Richmond, Henrico County, Virginia, by Special Orders No.60, Paragraph II, Adjutant & Inspectors General's Office, Montgomery, Montgomery County, Alabama, on 5 June, 1861, and arrived on 9 June, 1861. The company was mustered in Confederate service for the war at Richmond, Henrico County, Virginia, by Captain W C Holt, Confederate States Army, on 13 June, 1861. The company was ordered to proceed by the Virginia Central Railroad to Manassas Junction, Prince William County, Virginia, on 21 July, 1861, and arrived at Camp Pickens, Manassas Junction, Prince William County Virginia, on 23 July, 1861. The company was accepted in Confederate service at Woodville, Wilkinson County, Mississippi, under the command of Captian W L Brandon, on 24 May, 1861, and was ordered to Richmond, Henrico County, Virginia, by Special Orders No.58, Paragraph I, Adjutant & Inspectors General's Office, Montgomery, Montgomery County, Alabama, the same day. The company was mustered in Confederate service for the war at Richmond, Henrico County, Virginia, by Captain J Scott, cavalry, Confederate States Army, on 5 June, 1861, and Captian W L Brandon and First Lieutenant J Sims, Jefferson Davis Guards, were appointed major, 1st Mississippi Battalion Infantry, and captain, 1st Mississippi Battalion Infantry, Company D, on 11 June, 1861. The company was accepted in Confederate service at Woodville, Wilkinson County, Mississippi, on 6 June, 1861, and was ordered to Richmond, Henrico County, Virginia, on 19 June, 1861. The company was mustered in Confederate service for the war at New Orleans, Orleans Parish, Louisiana, on 20 June, 1861, and arrived at Richmond, Henrico County, Virginia, on 29 June, 1861. The company was accepted in Confederate service at Tallahatchie County, Mississippi, on 25 June, 1861, and was mustered in Confederate service for the war at Camp Davis, a quarter of a mile southwest of College Hill, Lynchburg, Campbell County, Virginia, by Major & Assistant Adjutant General H L Clay, Confederate States Army, on 7 July, 1861. The company was accepted in Confederate service at Canton, Madison County, Mississippi, on 1 July, 1861, and was was mustered in Confederate service for the war at Camp Davis, a quarter of a mile southwest of College Hill, Lynchburg, Campbell County, Virginia, by Major & Assistant Adjutant General H L Clay, Confederate States Army, on 15 July, 1861. The company was ordered to proceed by the Orange & Alexandria Railroad to Manassas Junction, Prince William County, Virginia, on 23 July, 1861, and arrived at Camp Pickens, Manassas Junction, Prince William County, Virginia, on 25 July, 1861. The company was accepted in Confederate service at Bovina, Warren County, Mississippi, on 2 July, 1861, and was ordered to proceed by the Vicksburg, Shreveport & Texas Railroad to Corinth, Alcorn County, Mississippi, at 3 PM the same day. The company arrived by the Southern (Mississippi) Railroad at Meridian, Lauderdale County, Mississippi, at 12 PM the same day. The company was ordered to proceed by the Mobile & Ohio Railroad to Corinth, Alcorn County, Mississippi, in the evening on 2 July, 1861, and arrived on 3 July, 1861. The company was assigned to the 4th Mississippi Battalion Infantry between 3 and 6 July, 1861, and to the 20th Mississippi Infantry on 6 July, 1861. The company arrived by the Memphis & Charleston Railroad at Iuka, Tishomingo County, Mississippi, on 7 July, 1861, and was ordered to Lynchburg, Campbell County, Virginia, on 15 July, 1861. The company arrived by the Virginia & Tennessee Railroad on 17 July, 1861, and was mustered in Confederate service for the war at Camp Davis, a quarter of a mile southwest of College Hill, Lynchburg, Campbell County, Virginia, by Major & Assistant Adjutant General H L Clay, Confederate States Army, on 18 July, 1861, dated 5 August, 1861. The company was ordered to proceed by the Orange & Alexandria Railroad to Manassas Junction, Prince William County, Virginia, on 27 July, 1861, and arrived at Camp Pickens, Manassas Junction, Prince William County,Virginia, on 29 July, 1861. The company was accepted in Confederate service, under the command of Captain B G Humphreys, at Sunflower County, Mississippi, on 2 July, 1861, and was ordered to Lynchburg, Campbell County, Virginia, on 31 July, 1861. The company was stationed at Vicksburg, Warren County, Mississippi, on 4 August, 1861, and was mustered in Confederate service for the war at Camp Davis, a quarter of a mile southwest of College Hill, Lynchburg, Campbell County, Virginia, by Major & Assistant Adjutant General H L Clay, Confederate States Army, on 9 August, 1861. The company arrived by the Orange & Alexandria Railroad at Camp Pickens, Manassas Junction, Prince William County, Virginia, on 10 August, 1861, and Captain B G Humphreys and First Lieutenant T S Gibson, 1st Mississippi Battalion Infantry, Company I, were appointed colonel, 21st Mississippi Infantry, and captain, 21st Mississippi Infantry, Company I, on 26 September, dated 11 September, 1861. The company was accepted in Confederate service under the command of Captain R W Flournoy, at New Albany, Union County, Mississippi, on 16 May, 1861, and was ordered to Richmond, Henrico County, Virginia, by Special Orders No.51, Paragraph III, Adjutant & Inspectors General's Office, Montgomery, Montgomery County, Alabama, the same day. The company was mustered in Confederate service for the war at Camp Davis, a quarter of a mile southwest of College Hill, Lynchburg, Campbell County, Virginia, by Major & Assistant Adjutant General H L Clay, Confederate States Army, on 17 June, 1861, and arrived by the Richmond & Danville Railroad at Richmond, Henrico County, Virginia, on 26 June, 1861. Captain R W Flournoy's resignation due to disability was accepted by Special Orders No.92, Paragraph V, Adjutant & Inspectors General's Office, Richmond, Henrico County, Virginia, on 9 July, 1861, and he was discharged on 15 July, 1861. Second Lieutenant N M Blackwell, New Albany Greys, was appointed captain, New Albany Greys, at Richmond, Henrico County, Virginia, on 20 July, 1861, and the company was ordered to proceed by the Virginia Central Railroad to Manassas Junction, Prince William County, Virginia, by Special Orders No.132, Paragraph XIII, Adjutant & Inspectors General's Office, Richmond, Henrico County, Virginia, on 1 September 1861, dated 23 August, 1861. The company arrived by the Orange & Alexandria Railroad at Camp Pickens, Manassas Junction, Prince William County,Virginia, the same day. The company was accepted in Confederate service at Vicksburg, Warren County, Mississippi, on 1 August, 1861, and was mustered in Confederate service for the war at Richmond, Henrico County, Virginia, on 19 August, 1861. The company was ordered to proceed by the Virginia Central Railroad to Manassas Junction, Prince William County,Virginia, on 16 September, 1861. "The following companies are assigned to duty, under the requisition just received from Montgomery for five regiments, to rendezvous at Corinth: Vicksburg Southrons, D. N. Moody." "The steamboat Gen. Quitman, Capt. White, which arrived this morning, brought down the Jeff Davis Guards, from Fort Adams, and the United Guards, from Donaldsonville." The Times Picayune, 30 May, 1861 - Arrival of more troops, ammunition, & c.
"The Volunteer Southrons, of Vicksburg, Mississippi, Capt. Moody, numbering 110 rank and file, one of the most substantial looking companies we have seen for many a day, arrived in Richmond yesterday." "My brother returned this evening. He did not suceed in joining the Monticello Guard from Carroll Parish. They had gone up the river, but he joined the Jeff Davis Guards at Vicksburg, and was elected 3rd lieutenant. It is an Irish company officered by Americans. It was raised by Dr. Buckner and Capt. Manlove, and if my brother had seen either of them on his way to New Orleans, they would have given him captaincy. Tom Manlove is captain. Uncle Bo cannot join it as private, as association would not be pleasant; and he is so disappointed not to be with my brother. He hopes to get in the Volunteer Southrons, which will leave Vicksburg in a few days. The Jeff Davis Guards leave for Richmond (Va.) on Monday, and so my brother and Uncle Bo get off in the morning as early as possible." "On the 19th July we were ordered to be ready to set out for Manassas. We reported at the depot, but could not go forward for want of transportation, preference being given to Hampton's Legion, in consequence of their having artillery." The 1st Mississippi Battalion Infantry was organised at Camp Davis, Howard's Grove, on the Mechanicsville Turnpike, one mile northeast of the Capitol, Capitol Hill, Richmond, Henrico County, Virginia, , under the command of Major W L Brandon, on 17 July, 1861. Vicksburg, Warren County, Mississippi, to Richmond, Henrico County, Virginia, Company B, 26 May-1 June, 1861: The Jeff Davis Guards or Manlove's Company was ordered to Richmond, Henrico County, Virginia, on 26 May, 1861, and arrived on 1 June, 1861. Vicksburg, Warren County, Mississippi, to Richmond, Henrico County, Virginia, Company A, 29 May-4 June, 1861: The Vicksburg or Volunteer Southrons was ordered to Richmond, Henrico County, Virginia, by Special Orders No.57, Paragraph I, Adjutant & Inspectors General's Office, Montgomery, Montgomery County, Alabama, on 29 May, 1861, dated 23 May, 1861, and arrived on 4 June, 1861. Vicksburg, Warren County, Mississippi, to Richmond, Henrico County, Virginia, Company D, 30 May, 1861: The Jeff Davis Guards was ordered to Richmond, Henrico County, Virginia, by Special Orders No.58, Paragraph I, Adjutant & Inspectors General's Office, Montgomery, Montgomery County, Alabama, on 24 May, 1861, and arrived by the steamer General J A Quitman at New Orleans, Orleans Parish, Louisiana, in the morning on 30 May, 1861. The company was accompanied by the United Guards or Poenix Company (See the 8th Louisiana Infantry). Brookhaven, Lincoln County, Mississippi, to Richmond, Henrico County, Virginia, Company C, 5-9 June, 1861: The Stephen Rifles was ordered to Richmond, Henrico County, Virginia, by Special Orders No.60, Paragraph II, Adjutant & Inspectors General's Office, Montgomery, Montgomery County, Alabama, on 5 June, 1861, dated 25 May, 1861, and arrived at Richmond, Henrico County, Virginia, on 9 June, 1861. Woodville, Wilkinson County, Mississippi, to Richmond, Henrico County, Virginia, Company E, 17-29 June, 1861: The Hurricane Rifles was ordered to Richmond, Henrico County, Virginia, on 19 June, 1861, and arrived via New Orleans, Orleans parish, Louisiana, on 29 June, 1861. New Albany, Union County, Mississippi, to Richmond, Henrico County, Virginia, Company K, 26 June, 1861: The New Albany Greys was ordered to Richmond, Henrico County, Virginia, by Special Orders No.51, Paragraph III, Adjutant & Inspectors General's Office, Montgomery, Montgomery County, Alabama, on 16 May, 1861, and arrived by the Richmond & Danville Railroad via Lynchburg, Campbell County, Virginia, on 26 June, 1861. Richmond & on the James River, east of the Reservoir or Water Works & Hollywood Cemetery, Oregon Hill, Richmond, Henrico County, Virginia, Companies A, B, D, E, & F, 5 June-19 July, 1861: The Vicksburg or Volunteer Southrons (110) was stationed at Richmond, Henrico County, Virginia, between 12 and 26 June, 1861, and on the James River, east of the Reservoir or Water Works and Hollywood Cemetery, Oregon Hill, Richmond, Henrico County, Virginia, between 1 and 10 July, 1861. The Jeff Davis Guards or Manlove's Company (74/76) was stationed at Richmond, Henrico County, Virginia, between 11 and 30 June, 1861, and (73/75) on the James River, east of the Reservoir or Water Works and Hollywood Cemetery, Oregon Hill, Richmond, Henrico County, Virginia, between 3 and 18 July, 1861. The Jeff Davis Guards (83/84) was stationed at Richmond, Henrico County, Virginia, between 5 and 30 June, 1861, and (92) on the James River, east of the Reservoir or Water Works and Hollywood Cemetery, Oregon Hill, Richmond, Henrico County, Virginia, on 10 July, 1861. The Hurricane Rifles (101) was stationed at Richmond, Henrico County, Virginia, on 6 June and 1 July, 1861, and on the James River, east of the Reservoir or Water Works and Hollywood Cemetery, Oregon Hill, Richmond, Henrico County, Virginia, between 9 and 15 July, 1861. The Tallahatchie Rifles (86) was stationed on the James River, east of the Reservoir or Water Works and Hollywood Cemetery, Oregon Hill, Richmond, Henrico County, Virginia, between 15 and 19 July, 1861. The New Albany Greys (78) was stationed on the James River, east of the Reservoir or Water Works and Hollywood Cemetery, Oregon Hill, Richmond, Henrico County, Virginia, between 10 and 12 July, 1861. Richmond & Howard's Grove, on the Mechanicsville Turnpike, one mile northeast of the Capitol, Capitol Hill, Richmond, Henrico County, Virginia, Company C, 10 June-20 July, 1861: The Stephen Rifles or Guards (56/57) was stationed at Richmond, Henrico County, Virginia, between 10 and 30 June, 1861, and (62) at Howard's Grove, on the Mechanicsville Turnpike, one mile northeast of the Capitol, Capitol Hill, Richmond, Henrico County, Virginia, between 5 and 20 July, 1861. Mustered for the war, Richmond, Henrico County, Virginia, Companies A, B, C, D, & L, 4, 5, 13, June & 19 August, 1861: The 1st Mississippi Battalion Infantry, Company B, was mustered in Confederate service for the war at Richmond, Henrico County, Virginia, by Captain J Scott, cavalry, Confederate States Army, on 4 June, 1861; Companies A and D for the war on 5 June, 1861; Company C for the war by Captain W C Holt, Confederate States Army, on 13 June, 1861; and Company L for the war at , on 19 August, 1861. Mustered for the war, Camp Davis, a quarter of a mile southwest of College Hill, Lynchburg, Campbell County, Virginia, Companies F, G, H, I, K, 17 June; 7, 15, & 18 July; & 9 August, 1861: The 1st Mississippi Battalion Infantry, Company K, was mustered in Confederate service for the war at Camp Davis, a quarter of a mile southwest of College Hill, Lynchburg, Campbell County, Virginia, by Major & Assistant Adjutant General H L Clay, Confederate States Army, on 17 June, 1861; Company F for the war on 7 July, 1861; Company G for the war on 15 July, 1861; Company H for the war on 18 July, 1861, dated 5 August, 1861; and Company I for the war on 9 August, 1861. Mustered for the war, New Orleans, Orleans Parish, Louisiana, Company E, 26 June, 1861: Company E at New Orleans, Orleans Parish, Louisiana, for the war on 26 June, 1861. The Vicksburg or Volunteer Southrons, the Stephen Rifles, the Jefferson Davis Guards, the Hurricane Rifles, the Tallahatchie Rifles, the New Albany Greys, and the Rocky Point Rifles were assigned to the 1st Mississippi Battalion Infantry, under the command of Lieutenant Colonel W L Brandon and Major J G Taylor, at Richmond, Henrico County, Virginia, by Special Orders No.224, Paragraph IX, Headquarters, Virginia Forces, Richmond, Henrico County, Virginia, on 17 July, 1861. James River, east of the Reservoir or Water Works and Hollywood Cemetery, Oregon Hill, Richmond, Henrico county, to Manassas Junction, Prince William County, Virginia, Companies A, B, D, & E, 20-22 July, 1861: The 1st Mississippi Battalion Infantry, Companies A, B, D, and E, under the command of Lieutenant Colonel W L Brandon and Major J G Taylor, were ordered to proceed by the Virginia Central Railroad to Manassas Junction, Prince William County, Virginia, by Special Orders No.224, Paragraph X, Headquarters, Virginia Forces, Richmond, Henrico County, Virginia, in the afternoon on 20 July, 1861, dated 17 July, 1861, but were detained by a collison on the Orange & Alexandria Railroad at 9 PM the same day. Companies A, B, D, and E arrived by the Orange & Alexandria Railroad at Camp Pickens, Manassas Junction, Prince William County, Virginia, in the morning on 22 July, 1861. Note: The 1st Mississippi Battalion Infantry, Companies A, B, D, and E, were ordered to proceed by the Virginia Central Railroad to Manassas Junction, Prince William County, Virginia, in the morning on 19 July, 1861, but were detained by the departure of the Hampton Legion Battalion Infantry (See the Hampton Legion). A collison on the Orange & Alexandria Railroad killed and wounded thirty-two of the 1st Kentucky Battalion Infantry, under the command of Major T Claiborne, Jr., at 9 PM on 20 July, 1861 (See the 1st Kentucky Battalion Infantry). Howard's Grove, on the Mechanicsville Turnpike, one mile northeast of the Capitol, Capitol Hill, Richmond, Henrico County, to Manassas Junction, Prince William County, Virginia, Company C, 21-23 July, 1861: The 1st Mississippi Battalion Infantry, Company C, was ordered to proceed by the Virginia Central Railroad to Manassas Junction, Prince William County, Virginia, by Special Orders No.224, Paragraph X, Headquarters, Virginia Forces, Richmond, Henrico County, Virginia, on 21 Jylt, 1861, dated 17 July, 1861, and arrived by the Orange & Alexandria Railroad at Camp Pickens, Manassas Junction, Prince William County, Virginia, on 23 July, 1861. Camp Davis, a quarter of a mile southwest of College Hill, Lynchburg, Campbell County, to Manassas Junction, Prince William County, Virginia, Company G, 23-25 July, 1861: The 1st Mississippi Battalion Infantry, Company G, was ordered to proceed by the Orange & Alexandria Railroad to Manassas Junction, Prince William County, Virginia, on 23 July, 1861, and arrived at Camp Pickens, Manassas Junction, Prince William County, Virginia, on 25 July, 1861. Note: The 1st Mississippi Battalion Infantry was assigned to garrison duty at Camp Pickens, Manassas Junction, Prince William County, Virginia, by Special Orders No.165, Headquarters, First Corps, Army of the Potomac, Camp Pickens, Manassas Junction, Prince William County, Virginia, on 25 July, 1861. Camp Davis, a quarter of a mile southwest of College Hill, Lynchburg, Campbell County, to Manassas Junction, Prince William County, Virginia, Company H, 27-29 July, 1861: The 1st Mississippi Battalion Infantry, Companies H and I, were ordered to proceed by the Orange & Alexandria Railroad to Manassas Junction, Prince William County, Virginia, by Special Orders No.234, Paragraph VII, Headquarters, Virginia Forces, Richmond, Henrico County, Virginia, on 27 July, 1861, and arrived at Camp Pickens, Manassas Junction, Prince William County, Virginia, on 29 July, 1861. Note: The 1st Mississippi Battalion Infantry was assigned to the Seventh Brigade, First Corps, Army of the Potomac, under the command of Colonel N G Evans, cavalry, Confederate States Army, by Special Orders No.169, Paragraph I, Headquarters, First Corps, Army of the Potomac, Camp Pickens, Manassas Junction, Prince William County, Virginia, on 25 July, 1861. Camp Davis, a quarter of a mile southwest of College Hill, Lynchburg, Campbell County, to Manassas Junction, Prince William County, Virginia, Company I, 27 July & 10 August, 1861: The 1st Mississippi Battalion Infantry, Company I, was ordered to proceed by the Orange & Alexandria Railroad to Manassas Junction, Prince William County, Virginia, by Special Orders No.234, Paragraph VII, Headquarters, Virginia Forces, Richmond, Henrico County, Virginia, on 27 July, 1861, and arrived at Camp Pickens, Manassas Junction, Prince William County, Virginia, on 10 August, 1861. Richmond, Henrico County, to Manassas Junction, Prince William County, Virginia, Companies K & L, 1 & 16 September, 1861: The New Albany Greys and the Vicksburg Confederates arrived by the Orange & Alexandria Railroad at Camp Pickens, Manassas Junction, Prince William County, Virginia, on 1 and 16 September, 1861, respectively, and were assigned to the 21st Mississippi Infantry, Companies K and L, on 26 September, 1861. Note: The New Albany Greys (92) was stationed on the James River, east of the Reservoir or Water Works and Hollywood Cemetery, Oregon Hill, Richmond, Henrico County, Virginia, on 26 August, 1861. The 1st Mississippi Battalion Infantry was designated the 21st Mississippi Infantry, under the command of Colonel G B Humphreys, Lieutenant Colonel W L Brandon, and Major J G Taylor, on 26 September, 1861. Note: The 21st Mississippi Infantry, Company D, was ordered to Woodyard's Ford, on the Bull Run River, on 25 October, 1861. Camp Pickens, Manassas Junction, Prince William County, to Leesburg, Loudoun County, Virginia, 9-12 November, 1861: The 21st Mississippi Infantry was ordered to Leesburg, Loudoun County, Virginia, on 9 November, 1861, and arrived on 12 November, 1861. Yorktown, York County, Virginia, Company G, 28 March, 1862: The 21st Mississippi Infantry, Company B, was assigned to the 2nd Mississippi Battalion Infantry, Company G, under the command of Lieutenant Colonel J G Taylor, at Yorktown, York County, Virginia, on 28 March, 1862, and the 2nd Mississippi Battalion Infantry was redesignated the 48th Mississippi Infantry on 19 January, 1863. Surrendered at Appomattox Courthouse, Appomattox County, Virginia, 9 April, 1865: The 21st Mississippi Infantry, under the command of Captain G R Cherry, 17th Mississippi Infantry, Company C, surrendered at Appomattox Courthouse, Appomattox County, Virginia, on 9 April, 1865.